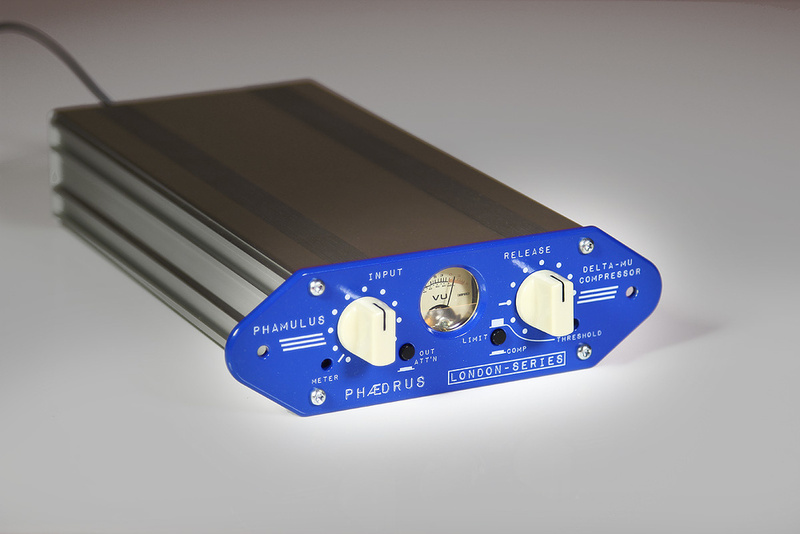 Maidstone-based manufacturers Phaedrus Audio make a growing range of hand-built tube and solid-state audio equipment. When I started my research on the brand, I discovered that the designer of the company’s London series of (mostly) tube-based products — “inspired by the leading British studios of the late 1950s”, as Hugh Robjohns put it in his review of the Hydra mic preamp in SOS March 2016 — is none other than Richard Brice, a name that I have encountered over the years in a variety of roles, ranging from hi-fi journalist and broadcast equipment designer to developer of the Francinstien stereo enhancement system. He is also the author of several fascinating books, including Multimedia & Virtual Reality Engineering, Music Engineering and Music Electronics. What I hadn’t appreciated until now was not only the extent of Brice’s career in the commercial side of broadcast technology, but also the depth of his musical background, which, no doubt, has contributed to his design work at Phaedrus Audio. As Hugh noted in his review, all of Phaedrus’ London series units share an unusual blue-bezelled, extruded-aluminium compact form factor that allows them to be used as desktop devices or, using an adaptor plate, to be rackmounted in pairs. Despite this forewarning, the Phamulus’s diminutive dimensions were a bit of a surprise, accustomed as I am to finding vari-mu compressors housed in multi-U 19-inch rackmount enclosures. Phaedrus make no secret of the fact that the Phamulus is based on the circuitry of the Altec Lansing 436C. There have been various ‘reworkings’ of Altec’s basic design, the most famous and extensive — and perhaps also the most revered — being EMI’s modification of the 436B in 1960. With the addition of a matched-impedance input-level control, a six-position release-time switch (with a unique hold function between each setting), an output-level attenuator and a new front panel (among other changes), the 436B turned into the RS124 that saw service in Abbey Road Studios, most famously with the Beatles. But Joe Meek also modified Altec units in his Holloway Road Studios, and various others similarly repurposed what were at the time relatively affordable compressors. 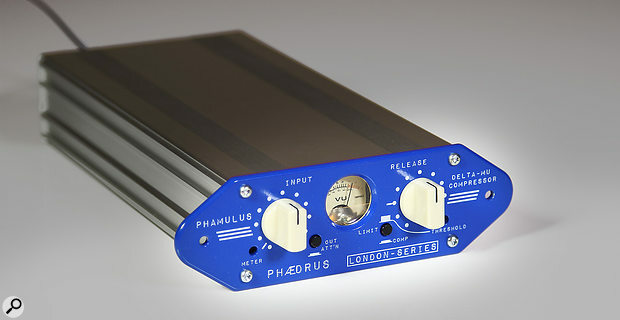 The most substantial alterations (apart from physical size) that Phaedrus have made are the use of a solid-state side-chain, the addition of a 12-position, detented front-panel control of the unit’s release time, a switchable -10dB output attenuator and the 600Ω internal load resistor that ensures compatibility with present-day equipment. Alongside the input-level and release-time rotary controls, the Phamulus’ front panel carries an In/Out switch for the fixed -10dB output attenuation, and a Compress/Limit selector. Being based on the 436C, the Phamulus carries that unit’s front-panel variable threshold trim pot, which is active only when the Limit option is selected. In Compress mode, the Phamulus’ threshold is set at 0dBm, which gives a compression ratio of 2:1, whilst the Limit threshold is factory set to the maximum -16dBm, producing a 4:1 ratio at that level. Increasing the Limit threshold via the front-panel trim pot will result in compression ratios between those two extremes. The final front-panel feature is the small, circular VU meter that displays the amount of gain reduction taking place, and the trim pot used to zero the meter if necessary, should components drift in value or be changed. On the back panel you’ll find input and output balanced XLR connectors, the jack for the stereo link cable, and the power-supply connector. Although based on the 436C, the Phamulus isn’t a slavish point-to-point wired copy, but it does carry over that which Phaedrus describe as the “natural contour” of hook-up wire in the curved tracks of its PCB boards, and the “classic” practice of star-earth grounding. As in the 436C, the balanced incoming signal passes through the unit’s input transformer and input attenuator to the Phamulus’s variable-mu element; a twin-triode, medium-mu, semi-remote cut-off 6BC8 or 6BZ8. These tubes were originally developed for consumer television receivers in the days of CRT screens and, as a result, are readily available at low cost as NOS (new old stock). All the voltages necessary internally are derived from the 12V AC wall-wart power supply that, to Phaedrus Audio’s eternal credit, is supplied with a locking connector. An alternative and vastly more expensive external power supply, the Phuel, is capable of supplying two London series components and is available for those with deep pockets and exquisite sensitivities. In the Phamulus, the solid-state side chain that controls the gain of the 6BC8/6BZ8 is based on a double-diode setup that replaces the 436C’s 6AL5 tube. The side-chain preset release-time trim pot in the 436C is replaced by the front-panel Release control, whilst the threshold control remains as a trim pot acting on the bias of the double diode, rather than on that of a 6AL5 tube. From the 6BC8/6BZ8, the balanced signal travels to the output amplifier, a 12AU7/ECC82 twin-triode valve in a push-pull configuration, and onwards, through the output transformer and switchable -10dB attenuator, to the 600Ω load and then to the outside world. You may have noticed my lack of mention of a hard (or soft) bypass switch, and that is because there isn’t one — the Phamulus is always in circuit. Personally, I can live without a hard bypass, but I’d have liked there to have been a soft-bypass switch that disabled the side-chain, thereby turning the Phamulus into a line amplifier with 30dB of gain for that overdriven transformer sound that can sound so delicious on the right source. Incidentally, the Phaedrus web site has a wealth of technical information on the subject of compression and the operation of the Phamulus and its circuitry, which I recommend to anyone interested in the detail of these subjects. The power supply interfaces securely with the main unit via a screw-fit connector. Once connected to the required +4dBu inputs and outputs, and having given it a good few minutes to warm up and settle down, operating the Phamulus is, as you’d expect from a variable-mu compressor, an intuitive experience. With an attack time of 50ms (as on the 436C) and a slightly shifted release time of 0.1s to 1.1s (as compared to the Altec’s range of 0.3s to 1.3s), the Phamulus’s overall performance is similar in character to that which I recall hearing from closer recreations of its original inspiration. As in other variable-mu compressors, the compression ratio increases the more the incoming signal exceeds the threshold. So, with the attack time fixed, the end result depends on the interaction that you create between source, input level, threshold and release time. Like any good Altec 436-based compressor, the Phamulus excels in the indefinable art of pulling a source or a mix together sonically. However, the lack of a side-chain high-pass filter (or external side-chain input) means that I personally would only consider it for compression duties on bass-heavy tracks as a parallel processor, and in that scenario I did miss the presence of a wet/dry mix control. Where the Phamulus really worked for me was sitting after the preamp, compressing a vocal, acoustic guitar or bass as it was being recorded, giving me level control and a sense of relaxed cohesion — plus that bit of additional warm harmonic richness when I pushed the transformers. Used as an overall limiter on a mix stem it acquitted itself well but, without a side-chain high-pass filter, I doubt that I’d use it myself to master a track unless I particularly needed that old-school sound. Although I didn’t have a pair to play with, linking two Phamuli (my Latin O-Level finally came in useful) in stereo is simply a matter of connecting them together using the supplied interconnect cable and setting the controls identically. To me, there’s something seductive about the sound of a good vari-mu compressor, and Phaedrus Audio’s Phamulus certainly has that attraction built-in. Although its circuitry is more than similar to that of the 436C on which it is based, its shape and size demonstrate not that is a clone of the original, but rather that Phaedrus Audio have used modern transformers, electronic components, materials and construction techniques to produce an Altec in a small box. Whilst the Phamulus doesn’t have the transformers to sound like a 436C or an EMI RS124, to my ears it does perform in a similar way and is, in its own right, a very good vari-mu compressor. Apart from a couple of 500-series products that aren’t directly comparable, the Phamulus is, by a long way, the most cost-effective example of that genre that I know; it offers a performance package that is seriously good value for money. Apart from two 500-series units (Retro Instruments’ Doublewide Tube Compressor and IGS Audio’s Tubecore 500), I couldn’t find a hardware vari-mu compressor at anywhere near the price of the Phamulus, so if you want that sound, the Phamulus is the value choice. Essentially an Altec 436C in a small box, the Phaedrus Audio Phamulus delivers the core of the performance of that classic variable-mu compressor at a very attractive price.